Yesterday we shared the first photos for the next Godzilla re-releases from Tamashii Nations. Now we have a full update on the S.H. 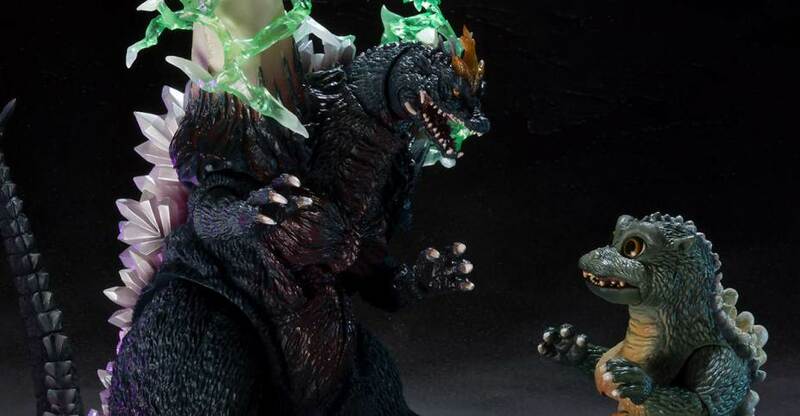 MonsterArts Space Godzilla and Little Godzilla Special Color Versions. As expected, this set is a Bandai Premium Web Exclusive in Japan. This set features characters from the 1994 film Godzilla vs Space Godzilla. The special color versions have new paint decos including dirt paint apps to appear as if mid-battle. Space Godzilla will include effects pieces. The Space Godzilla figure will stand at 6.5″ tall. Little Godzilla will stand at 3.75″ tall. Pre-orders will go live on Friday, September 15th in Japan. The set will be release in February 2018. It will be priced at 14,904 Yen (about $134 USD). You can see all of the photos by reading on.